Liverpool face Manchester City at Anfield on Sunday afternoon as they look to put their loss in the Europa League behind them. The Reds have been on fantastic form in the league lately but will face a tough challenge in Pellegrini's side. Injuries for Liverpool have taken a bit of a boost with the return of Philippe Coutinho. The game however may be too early for Jordan Henderson and it looks like Steven Gerrard will also remain on the sidelines. Mancehster City are very strong and Pellegrini is able to call upon a full sqaud with the return of Yaya Toure after he served a suspension and missed the Champions League tie with Barcelona. It was a long old game for Liverpool on Thursday evening as they traipsed through 120 minutes of football only to crash out of the Europa League with the final kick of the game as Dejan Lovren failed to convert the Reds' all important fifth penalty. It was a frustrating game to say the least and so this match report may not follow a usually strategic structure. The first thing to note about the game, apart from the deafening noise from the Besiktas fans was the extremely attacking line up deployed by Brendan Rodgers. 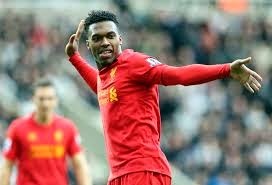 I couldn't quite believe what I was seeing, as a big fan of Balotelli and somebody who would like to see him be given a real chance in a front two, I was very pleased to see him paired with Sturridge. Not only this but Jordan Ibe and Raheem Sterling were also starting. Liverpool travel to Turkey on Thursday evening as they prepare to face Besiktas in the second leg of their Europa League tie. The match at the Ataturk is sure to create a special atmosphere for the travelling fans who must be thankful that the Reds go into this match with a lead. Injurys have taken a turn for the worse for Liverpool who will be unable to call upon Steven Gerrard, Jordan Henderson, Philippe Coutinho, Glen Johnson, Mamadou Sakho and Lucas Leiva. Things aren't much better for Besiktas either who have doubts over Demba Ba after he picked up a calf problem. The last time the two sides met of course was last week and Liverpool came out on top after a late controversial penalty was converted by Mario Balotelli. Liverpool somehow managed to collect a 2-0 victory at St Marys on Sunday afternoon despite having to soak up immense pressure from the home side. An early piece of magic from Philippe Coutinho put the Reds into the lead and Raheem Sterling was allowed to find a second goal at 73 minutes. It was a rather strange line up chosen by Brendan Rodgers as Daniel Sturridge, Alberto Moreno and Mario Balotelli were all sat on the bench. Replacing the injured Mamadou Sakho in defence was Dejan Lovren and it was safe to say most (not all) fans were questioning that line up, including myself. It's no secret I hate playing without a striker but I was also disappointed with the missing Moreno and the fact that Lovren had gained a start. However, whilst our performance wasn't necessarily tip top, the team pulled off another big win and I have to give credit for that. Liverpool travel down south on Sunday as they aim to pick up another win in the Premier League away at Southampton. The Reds are currently on a brilliant run of form and have also picked up wins in the Europa League and the FA Cup recently. Can Brendan Rodgers get the better of Ronald Koeman though? 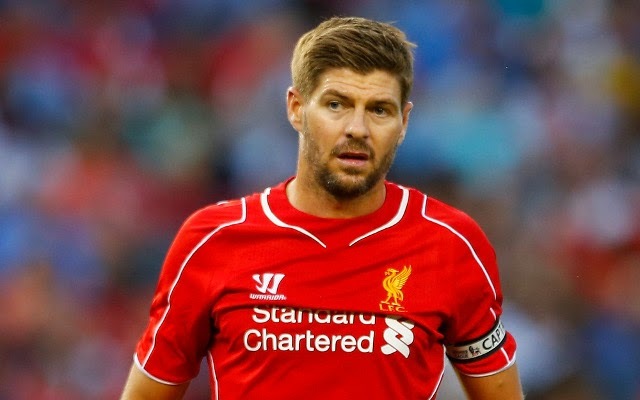 Injury news for Liverpool mean they are still unable to call upon captain Steven Gerrard who will be out for a while longer. Raheem Sterling though is expected to start after getting some game time against Besiktas. For Southampton they are looking relatively strong as Ronald Koeman expects to see the return of Shane Long, Morgan Schneiderlin and Matt Targett. Form wise Southampton are also in pretty good shape. They have only lost one in their last nine and that came against Swansea. 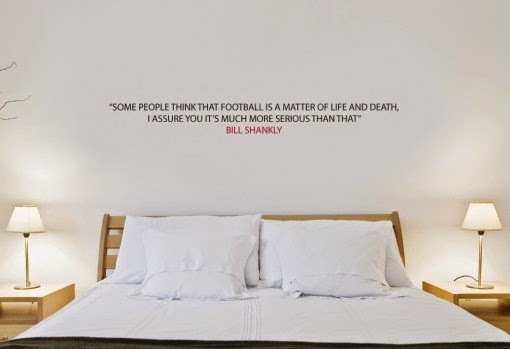 Their last fixture in the league saw them draw 0-0 with West Ham. They have scored four goals in their last five league games. Just when I thought I could finally write about Mario Balotelli without having to somehow justify his ability, here we go again with penalty gate. If you weren't aware Liverpool actually won last night thanks to a Balotelli spot kick but you'd be forgiven for not realising that what with the uproar. Rodgers fielded a strong team and stuck with his now cemented formation of three at the back and Daniel Sturridge up top. The first half resembled almost every Liverpool game of late. Loads of movement, some real fluidity which, granted is brilliant to see however I personally find it very frustrating watching this style of play when you are forever waiting for an end product. The Reds kick off their Europa League campaign on Thursday evening as they welcome Turkish side Besiktas to Anfield. Liverpool will surely still be feeling the disappointment of dropping out of the Champions League to gain their place in this competition however silverware is at stake and the winners are also automatically entered into next year's European Cup. Add to this a return leg at the Ataturk Stadium and fond memories of the Champions League will certainly be bubbling up for the Reds who need to get off to a good start on home ground. Injury news for Liverpool is relatively the same, a positive for Brendan Rodgers however was the return of Raheem Sterling to training this week. It will also be interesting to see whether the boss will start Mario Balotelli after his involvement in Liverpool's last two wins. Liverpool notched up a win over Crystal Palace at Selhurst Park on Valentine's Day for the first time since 1997. 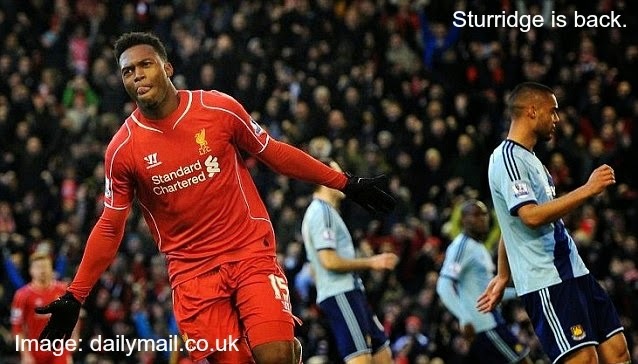 Love was certainly in the air as the travelling Kop celebrated goals from Daniel Sturridge and Adam Lallana. Despite concerted efforts from the Eagles they didn't quite have enough in the tank to throw Liverpool off course. 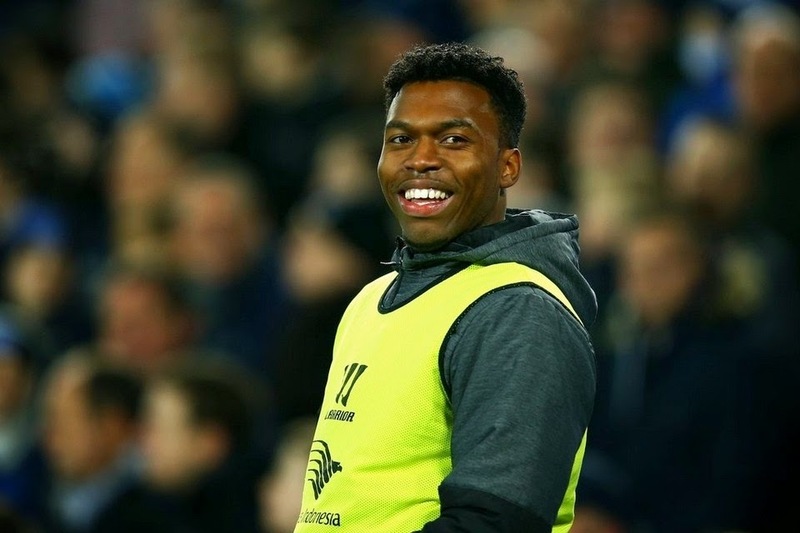 With several injuries to cater for Brendan Rodgers was forced to select a slightly different team but it was always going to be Daniel Sturridge playing up top. Mario Balotelli was forced to settle for a place on the bench. Liverpool travel to London tomorrow as they prepare to face Crystal Palace in the fifth round of the FA Cup. The Reds have a Europa League tie with Besiktas coming up soon but the FA Cup is perhaps Brendan Rodgers' best chance of steering his side to some silverware. Injuries for Liverpool mean they will unfortunately be without captain Steven Gerrard for this tie who is out for three weeks after picking up a hamstring injury against Spurs. Also unavailable is Lucas Leiva while Jordan Ibe is cup tied. Raheem Sterling will undergo a late fitness test. For Crystal Palace they are unable to call upon Jedinak and there are doubts hanging over the fitness of Sanogo and McArthur. Crystal Palace are currently behind Liverpool in the Premier League sitting in 13th place with the Reds in 7th. Palace drew their last fixture in the league after a 1-1 draw with Newcastle whilst Liverpool notched up a late win over Tottenham thanks to a Mario Balotelli winner. 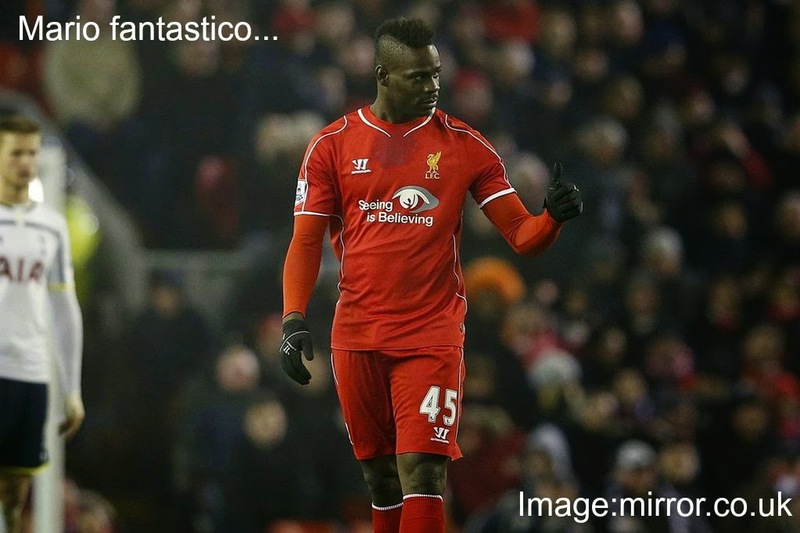 Mario Balotelli scored the winning goal on Tuesday evening as the Italian secured all three points for the Reds in the 84th minute. In an end to end game Brendan Rodgers' side took the lead twice only to watch Spurs level the scoreline before eventually sealing the win. The game started with electrifying pace as both sides created dangerous attacks. With possession being foolishly lost in midfield it became easy for both sides to break and it wasn't long before Liverpool took advantage and scored their first goal of the game. After Simon Mignolet made a save at the other end of the pitch his resulting kick found its way to Daniel Sturridge, with Markovic to his left he laid the ball to him and continued his run. As Lazar squared up to take his shot I found myself wondering why he wasn't passing it however his somewhat tame shot found its way past Hugo Lloris who perhaps should have done better. Liverpool welcome Spurs to Anfield on Tuesday evening and will be hoping they can produce a better performance after a rather dire Merseyside derby at the weekend. The game will surely have its focus placed on the English strikers of both sides with Harry Kane banging in the goals for Spurs and Daniel Sturridge having recently returned for Liverpool. Injuries for Liverpool mean they are unable to call upon Lucas who injured his thigh in the Everton game. 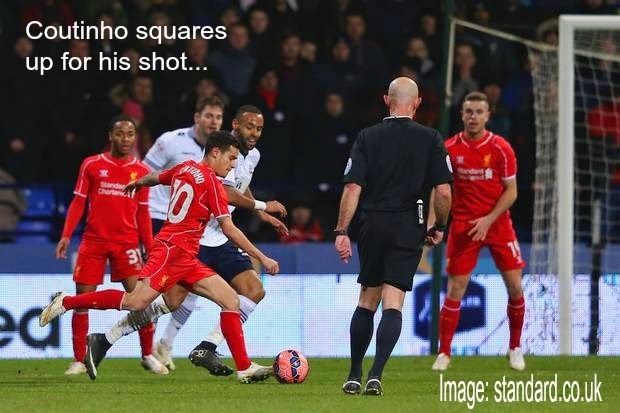 There is also a doubt hanging over Philippe Coutinho who picked up a knock in the same game. 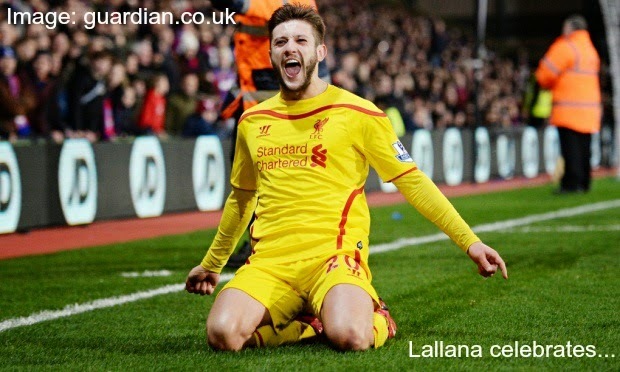 Positively for the Reds Adam Lallana could return to the side. For Tottenham they are relatively strong squad wise and it is presumed that Pochettino will name the same side fielded in Spurs' Arsenal win at the weekend. Liverpool are currently 7th in the league but have not lost a league game in their last eight. Spurs sit in 5th, four points ahead of the Reds and have won their last three league fixtures. Liverpool came away from Goodison Park with just a point on Saturday evening as Brendan Rodgers' side once again created movement and strings of attacks but failed to score. Liverpool have been riding on the hope that Sterling or Coutinho will find the back of the net for several matches now and in the Merseyside derby it just didn't work. It's no secret that I hate playing without a striker and whilst several fans keep telling me that this formation works, it is my opinion that it does not. Not with the personnel we are currently using anyway. Sterling for me needs to be placed in his natural position and we need to play with a striker. Whilst three at the back appears to have been working a treat lately also Mamadou Sakho is forever creating a lack of confidence with his poor ability to retain possession and choose the correct pass. Liverpool cross Stanley Park tomorrow to face Roberto Martinez's Everton side in what will almost certainly be Steven Gerrard's last ever Merseyside derby. The Reds come into this game on the back of an FA Cup win in the week and will be looking to continue their current good run of form in the league. Injuries for Liverpool mean they may be unable to call upon Lazar Markovic, Lucas Leiva and Adam Lallana who have all recently picked up knocks. Everton are without Pienaar and Osman whilst there is a doubt hanging over Tim Howard. 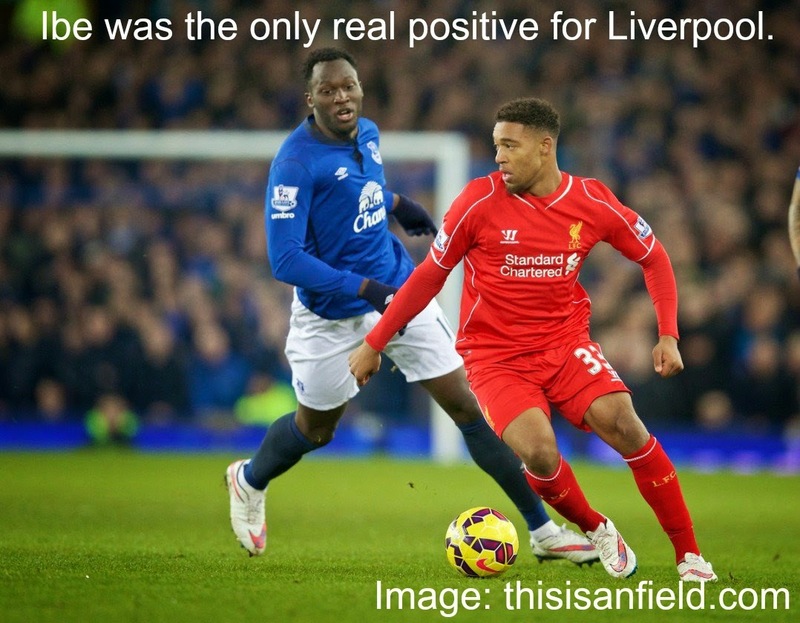 The Toffees may however decide to call upon their happy chappy Aaron Lennon. The Reds are currently 7th in the table and they haven't lost a game in the league in their last seven. Everton on the other hand find themselves 12th in the league having won just two of their last 10 league games. Their last victory came against Crystal Palace in January where Romelu Lukaku scored the winner. A late burst of magic dust from our trickster Philippe Coutinho was enough to see Liverpool progress to the 5th round of the FA Cup on Wednesday night. The Reds eventually managed to beat Bolton after the home side netted a penalty in the 58th minute. A dismissal followed soon after for Bolton and Sterling found an equaliser pushing the Reds on to find their last gasp winner. The first half was pretty poor for Liverpool with the same predictable outcome being put on display. Get the ball to Coutinho or Sterling and hope they can weave through and bag a goal. Problem was though that Bolton were not prepared to let us through and were more than content in creating attacks of their own. By the end of the first half though, there was no real excitement and both goalkeepers had remained relatively quiet. The only moment of note really was a yellow card picked up by Danns that would prove to be vital in the second half for Liverpool. Liverpool make the short trip to Bolton on Wednesday evening as they aim to make it through to the 5th round of the FA Cup. The first meeting between the two sides ended in a 0-0 draw forcing a replay at the Macron. Neil Lennon's side will fancy their chances at home to Liverpool but Brendan Rodgers will surely be determined to push his side closer to some silverware after being knocked out of the League Cup by Chelsea. Injuries for Liverpool remain the same with just Brad Jones and Jon Flanagan unavailable. Steven Gerrard is set to return after being rested against West Ham and if he features it will be his 700th appearance in the Red shirt. For Bolton they are unable to call upon Adam Bogdan and Darren Pratley. Doubts are also hanging over the fitness of Craig Davies and ex Red Emile Heskey. Liverpool notched up a 2-0 win over West Ham on Saturday as youngster Raheem Sterling found the back of the net followed by a returning Daniel Sturridge. The long awaited return of the number 15 could not have been more perfect, a standing ovation as he prepared to enter play on the touchline was quickly followed by rapturous celebration as he found Liverpool's second goal of the game in style. The first half for Liverpool was not brilliant in all honesty. The Reds were creating a lot of movement and West Ham offered little threat however we couldn't seem to find that final killer ball. Breaks from the likes of Coutinho and Sterling almost had the Hammers in knots particularly after a link up early on between these two. A lovely back heel from Sterling fell for Philippe Coutinho, squaring up for the shot it looked like the perfect chance to take the lead however the Brazilian was denied by Adrian.